“Live In Place installed two stair lifts in our townhouse, one to go up to the bedrooms and one to go down to the family room/basement. Later it looked like we would have to leave the house and move into assisted living. Live In Place took the time to meet with our contractor and discuss some modifications that could be made to the townhouse [without] going the assisted living route. When we decided to remodel the house, Live In Place removed the lifts and stored them for us during the renovation. They made the suggestion to install grab rails at the front door and near the stair lifts to make getting in and out of the lifts easier. My father-in-law was so impressed by Live In Place’s work and customer service that he also had a set of lifts installed in his house. 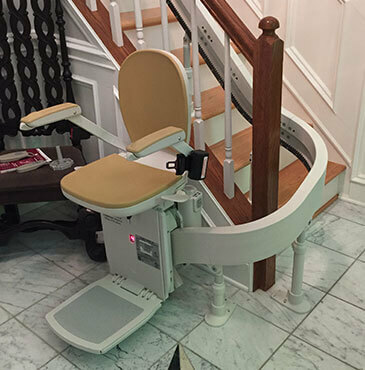 If you or a family member ever need stair-lifts then this is your go-to vendor.” – J.W. “I was so ready to get home after my stay in rehab for a heart attack. Prior to release, I was doing really well and my energy was up. When I came home, my routine and the stairs wiped me out. Live In Place checked my whole house and made recommendations. The changes they made have helped me return to the activities I love and to stay in my home.” – Bernie C.
“They do great work and are very patient to explain the pros and cons of aging in place for the elderly or their children.” – Erik K.
For more information about Live In Place and our full line of mobility and accessibility solutions, contact us today at (703) 433-0380 or request a consultation.